The 1920s signal box at Ringwood Station travelled by crane to a new site nearby as part of the recent major works at the station to create a new transport hub in Ringwood. Our involvement with Ringwood Station began with heritage advice provided in the period 2007-2013. We then implemented conservation works for the three buildings on the site included in its Victorian Heritage Register listing — the brick station building, a timber waiting room on the opposite platform and the signal box. The waiting room has been moved about a metre to accommodate disability access requirements. 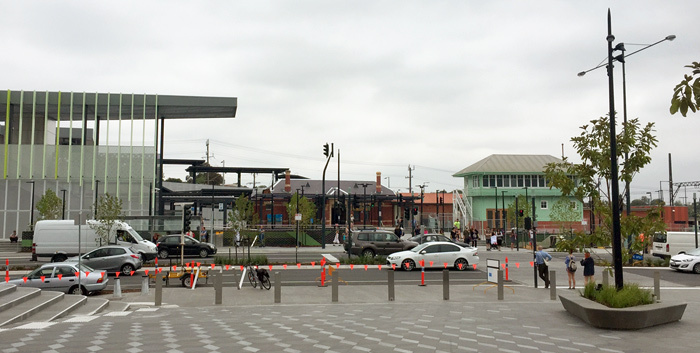 The two-storey signal box was craned to its new position over a day, clearing twin rail tracks, the station itself and the nearby bus interchange. It now occupies a prominent site facing the Maroondah Highway.